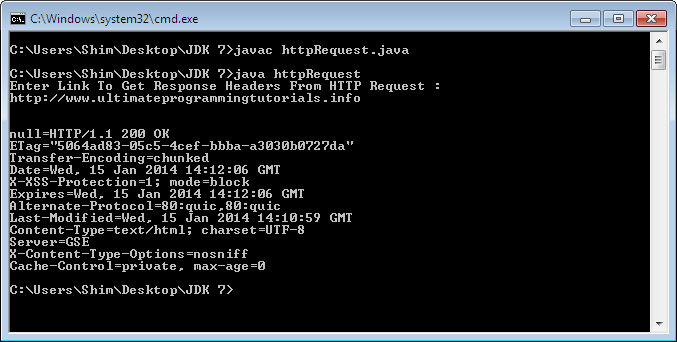 With this Java program you can get the the response headers from a HTTP request. You may have seen HTTP headers in Google Chrome/Mozilla Firefox network feature in inspect element (it just automatically captures HTTP). All you have to do is run the program from command-line or on eclipse (or any IDE you want), after executing the program you will be asked to enter an URL to get the response headers from HTTP request (Note : make sure you don't enter URL's without 'http://'). Within seconds you will get the HTTP request response headers one after the next line. Okay let me put all the parts together, it uses Scanner(that to get the users input), Map, List, Set, Iterator, a while loop, String Builder and finally it prints. What can I say? It's just another simple java program by me(of course got help from many resources). I hope you really like it or found it useful, share it if it deserves and PEACE!. I am not a lot into "technical stuff" of blogging and I hate when I need to code or modify the CSS. But this kind of article surely is a useful guide. Thanks for sharing at Klinkk, Mohamed! Great Article. Very useful for Java SE & Java EE Developer. The increase typing skills is such a crucial part of ourmodern lifestyle. From this site we can help you get your speed wherever you want it to be. It’s easier than you might think!